Nic buys a new Kindle and tells you what he thinks about it. Read and find out if you should buy one. Kindle 4. Image courtesy of Amazon. I bought a Kindle 4 (a.k.a. “Kindle no keyboard”, a.k.a. just “Kindle”—Amazon’s nomenclature regarding this device is a bit opaque. I’ll call it the Kindle 4.) Here are some impressions from a few days of heavy usage. A definite improvement over the Kindle 3, but we’re talking evolution, not revolution. The Kindle 4 is slightly smaller, slightly lighter, feels less plastic-y, and of course doesn’t have that silly keyboard you never used anyway. Second—and yes, I know this is the height of first world problems—Amazon changed the on/off switch to be a button instead of a slider. It makes a huge difference. Finally, the screensavers are no longer semi-creepy woodcuts of dead people. Instead, they’re fine-arts photos of writing implements like fountain pens, typewriter keyboards and lead type. They look nice and blend well with the metallic-looking bezel. On the downside, the page forward and back buttons still feel cheap. Now that the rest of the Kindle is nicer, that tacky feeling is more jarring. You do get used to it, but if there’s one thing I hope for the Kindle 5 or whatever it will be called when it comes out, it’s less ratty buttons. But Amazon giveth and Amazon taketh away. The Kindle 4 has no audio, so no more audio books. I guess Amazon discovered that people who want to listen to audio books usually listen to them on mp3 players or their cell phones instead of dragging around a slate with an e-ink screen. And without the larger audio file sizes to consider, Amazon did the obvious thing and cut the internal storage to 1.25 GB usable. Which is OK. Really. E-books are small. 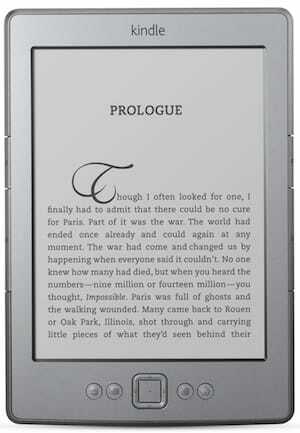 If you already have a Kindle 3, should you get the Kindle 4? Maybe. It’s definitely nicer, but not a massive leap forward. Unless you’re like me and the sheer existence of the keyboard-to-nowhere annoys you and you look up a lot of word definitions, I’d put the money into books instead. I sprung for the non-advertising-supported Kindle, since my sanity is worth more than $30. I expend a lot of time, effort and money to expose myself as little as possible to advertising, especially when it comes to my reading. I don’t want to read in a bazaar with people yelling at me. As a sidebar here, Kindle OS 4 defaults to only doing the page refresh every five or so page turns, which reduces the page-turn flash frequency at the expense of the text getting grayer. This to me seems non-optimal. My brain already filters the page-turn flashes. I don’t see them. If they only happen every once in a while I might notice them. And I don’t cotton to reducing the text quality. There’s a Kindle OS 4.0.1 update which lets you turn this silliness off. Make sure to update. But the Kindle 4 wasn’t the only announcement Amazon made. There’s also the Kindle Touch and Kindle Fire coming down the pike. I’m not at all interested in the Touch since—sing it with me, kids—the screen will become smudged. Aaaaaarrrrgghhh. Fingerprints on screen bad! Hulk smash! Another wrinkle in the purchasing calculus is the base Kindle no longer has 3G support—if you rely on that, you’ll have to step up to the Kindle Touch or Kindle Fire or get a previous generation Kindle Keyboard 3G (née Kindle 3 3G. Kindle names are fun). The Kindle Fire definitely has my interest, but since I already pawned my future to purchase two iPads, I can’t really justify getting one. But I’m pretty sure Amazon has a hit on their hands. From what I’ve seen so far, it looks like a great media consumption device at a very, very nice price point. If you have plenty of disposable income and no idea what to give somebody for Christmas this year, the Kindle Fire is your answer.